Figure 1. An artist's impression of Al-Biruni (© Muslim Heritage). Islamic mathematical achievements were many as here outlined by Sabra . Islamic scholars devised and successfully applied new and elaborate techniques of computations; they constructed sophisticated mechanical computers; devised methods for calculating with decimal fractions; took significant steps toward extending the concept of number inherited from the Greeks, so as to include irrational magnitudes as well natural numbers and common fractions; added to the limited, ad hoc trigonometric methods they learned from the Greeks (Ptolemy's chord function) and from the Indians (the sine and tangent functions) and eventually developed them into an independent discipline no longer subservient to astronomy. They recast the algebraic modes of solving numerical problems found among the Greeks and the Indians, thereby creating a new form of algebraic discourse and setting the science of algebra on a new course (but without introducing a symbolic calculus), and they went a long way in exploiting the use of higher geometry (conic sections) in the solution of higher-than-quadratic equations . Sarton outlines some of the accomplishments of eminent Muslim mathematicians. Al-Khwarizmi, the Banu Musa, Al-Kindi, and others. The 10th century gave us much more, in mathematics, the so-called dust (ghubar) numerals, the numerals we use in our modern calculation were used in Muslim Spain (The eastern forms still used in the eastern block of the Arab world look like the Hindu numerals). In the same 10th century, Abu Jaafar al-Khazin wrote commentaries on the tenth book of Euclid and on other works and solved al-Maham's cubic equation; Al-Sagham investigated the trisection of the angle; Abu-l-Wafa' wrote commentaries on Euclid, Diophantos, and al-Khwarizmi, arithmetical and geometrical treatises, and solved a number of geometrical and algebraical problems; Al-Sijzi made a special study of the intersections of conics and found a geometrical means of trisecting angles; Al-Khujandi proved that the sum of two cubic numbers cannot be a cubic number; Maslama ibn Ahmad composed a commercial arithmetic and studied the amicable numbers, and so much more . Scott too, notes how in their treatment and application of the exact sciences, and especially in the development of the higher branches of mathematics, the Muslims exhibited pre-eminent ability . The decimal system was also introduced by them; they greatly advanced the study of algebra, whose scope and possibilities had previously been imperfectly understood and applied it to geometry, and they substituted sines for chords, invented modern trigonometry, and proposed a formula for the solution of cubic equations . In the words of Ronan, Islamic mathematics brought into the mathematical art two powerful techniques — algebra and trigonometry — which are as valid today as they were when the Muslims introduced them . A considerable bibliography is provided here to enlighten on the scope of Islamic mathematics and to form the foundation for younger researchers to study the real impact of Muslims on this science; a study which is still waiting . Still, possibly, the best historians of sciences from Islamic countries are in the exact sciences, in general, and mathematics in particular. To their labours we owe a great deal to the richer knowledge of the role of Muslim mathematics. Amongst such historians must be cited Rashed , Djebbar , al-Daffa , Jaouiche , Lamrabet , and, of course, Sezgin . Figure 2. 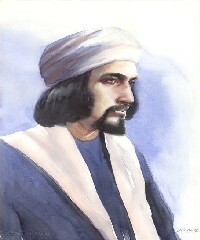 An artist's impression of Al-Kindi (Image from www.muslimheritage.com). The most eminent early mathematicians of Islam came from the East, i.e Iraq, and include amongst them Al-Khwarizmi, the Banu Musa Brothers, al-Kindi, al-Battani, and Abu'l Wafa. It is only possible to refer to a few of the subjects addressed by these mathematicians. The first great Muslim mathematician was Thabit ibn Qurra, whose astronomical work at Baghdad has already been described. He wrote on the theory of numbers and extended their use to describe the ratios between geometrical quantities — a step the Greeks never took — and he discussed the question of where, if anywhere, parallel lines can meet. 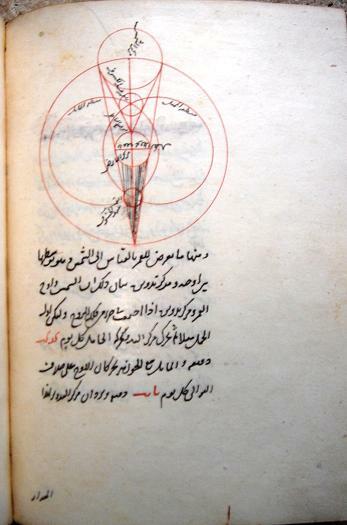 Ibn Qurra also prepared a Book of Data, a geometrical book, which was to have a vogue in the West in the Middle Ages . Al-Khwarizmi was the author of Kitab al Mukhtassar fi'l hisab al jabr wa'l muqabalah (Compendious Book of Calculation by Completion and Balancing). Sabra tells that the title of the treatise, `al jabr wal muquabala,' referred to the two operations used by him in the process of solving linear and quadratic equations, namely those of eliminating negative quantities and reducing positive quantities of the same power on both sides of the equation . Sabra points out that these terms, which may be translated as restoring (or completing) and balancing respectively, could be traced to concepts already present in the work of Diophantus, but no prototype of al Khawarizmi's book as a whole is known to have existed in any language prior to the 9th century . Al-Khwarizmi who wrote to show ‘what is easiest and most useful in arithmetic', in which he used algebra in our modern problem to one of six standard forms, using two processes, the first known as al-jabr, the second as al-mu qabala. Al-jabr was concerned with ‘transferring terms' to eliminate negative quantities (so that, for example, x = 40 - 4x becomes 5x= 40); al-muqabala was the next process, that of ‘balancing' the positive quantities that remain (thus if we have 50 + x 2 = 29 + 10x al-muqahala reduces it to x2 + 21 = 10 x) . Al-Khawarizmi's treatise started something new; its systematic approach represented by its reduction of the treated problems to canonical forms provided with proofs, and "can be said to have impressed its character on subsequent algebraic works, even when these (like the treatises of al-Karaji and Umar Khayyam) went far beyond it ." Another of the Baghdad astronomer-mathematicians was al-Battani, and his notable achievements were, first, that he gave up the old Greek system of chords of angles and adopted the far more convenient trigonometrical proportion known as the sine; he also used its converse ratio, the cosine. With Hipparchos and Ptolemy, the Greeks had come close to trigonometry but they had never finally settled on the ratios that al-Battani adopted, and which, because of their simplicity and convenience, were to revolutionise the mathematics of triangles used so much in astronomy and surveying, divesting it of some of its previous difficulty. Al-Battani's second achievement was his use of trigonometry, and the projection of figures from a sphere on to a plane, to allow him to get some new and elegant solutions to astronomical problems. Al-Battani (850-929 CE) the first to use the expressions "sine" and "cosine" was very much aware of the superiority of his `sines' over the Greek chords . His methods were copied in Western Europe in the fifteenth century by the astronomer Regiomontanus . The Banu Musa brothers (early 9th century) wrote amongst others on the measurement of the sphere, and discovered kinematical methods of trisecting angles and of drawing ellipses . Al-Kindi's (801-873CE) works on mathematics were numerous—Flugel in his monograph on al-Kindi gives the titles of more than twenty—and their influence is not to be underestimated . He wrote on spherical geometry and its uses in astronomical works; an introduction to arithmetic and the theory of numbers . Al-Kindi's lasting influence on subsequent Western scholars has already been briefly noted. His two treatises on geometrical and physiological optics were utilised by Roger Bacon and the German physicist Witelo . Al-Kindi's influence was so widely felt that Geronimo Cardano (1501-1576 CE), the Italian physician and mathematician, considered him one of the twelve great minds of history . This is no more than might be expected, if we consider the field of interest of Cardano, who among the moderns perhaps most nearly resembles al-Kindi . Figure 3. A geometrical shapes from Suhayl al-Quhî's book "Fî istihraci mesaha al-muhassama al-maqafî or Risala-i abu Sahl". Suleymaniya Library, Ayasofya 4832. 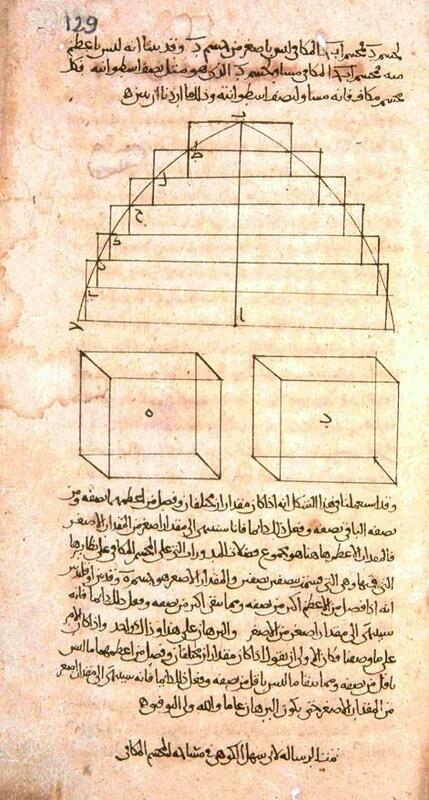 Abu'l-Wafa, making a special study of the tangent, tabulated its values, and introduced the secant and the cosecant . He knew the simple relationships between these six basic trigonometric functions, which are often used even today to define them . All regions of the Muslim world produced great mathematicians. North Africa, or more precisely the city of Bejaia in today's Algeria is the foundation of modern Western mathematics through Leonardo Fibonacci, just as Al-Qayrawan is the origin of today's Western medicine (through Salerno). The Moroccan cities of Fes and Marrakech produced some of the greatest mathematicians of the 13th century. Abd al-Wahid Al-Marakushi was born in Marrakech in 1185 CE; his main work is Jami al-Mabadi wal-ghayat (Compendium of the Principles and Objectives); i.e: principles and results), probably completed in 1229-1230 CE , which has much on trigonometry and gnomonics . The Jami of Hassan al-Marrakushi was, Sarton holds, the most elaborate trigonometrical treatise of the Western Caliphate, the best medieval treatise on gnomonics and the best explanation of graphical methods . The section dealing with gnomonics contained studies of dials traced on horizontal, cylindrical, conical, and other surfaces for every latitude . Al-Marakushi gave a table of sines for each half degree, also tables of versed sines and arc sines (this last one he called the table of al-Khwarizmi). To facilitate the use of gnomons he added a table of arc cotangents . 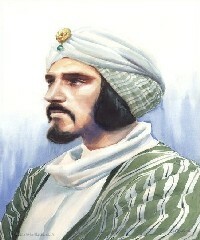 Ibn al-Banna was born in 1256 CE also in the city of Marrakech. He studied geometry, fractional numbers and learnt much of the impressive contributions that the Muslims had made to mathematics over the preceding 400 years . At the university in Fez, Al-Banna taught all branches of mathematics, which at this time included arithmetic, algebra, geometry and astronomy. Many students studied under al-Banna in this thriving academic community . Based on the inventory that was made, at the time, by Ibn Hayder, Ibn al-Banna seems to be in fact the author of more than 100 titles, of which 32 concern Mathematics and Astronomy . His work Tanbih al-albab,(alerting the minds) the first part of which contains the precise mathematical answers to domains of everyday life ; the second part, which belongs to the already ancient tradition of judicial and cultural mathematics, joins a collection of little arithmetical problems presented in the form of poetic riddles . Al-Banna's other best known work is Talkhis amal al-hisab (Summary of the Operations of Calculation) which contains many new features, including improved treatment of fractions; sums of squares and cubes; casting out of nines, eights, and sevens; rules of double false position . It is in this work that al-Banna introduces some mathematical notations which have led certain authors to believe that algebraic symbolism was first developed in Islam by Ibn al-Banna and al-Qalasadi (1412-1486 CE) . Figure 4. A mathematical figure from Ali Kuscu's book Risâla al-Fathiyya fi ilmi'l-Hay'a. Süleymaniye Library, Ayasofya 2733. "In the richness of its contents and in the application of arithmetical and algebraic methods to the solution of various problems, including several geometric ones, and in the clarity and elegance of exposition, this voluminous textbook is one of the best in the whole of medieval literature; it attests to both the author's erudition and his pedagogical ability ." Due to its high quality, this work was frequently copied, and served as a manual for hundreds of years . The other scholar of renown from the region was Qadi Zada Rumi (born 1364 in Bursa, Turkey; died: 1436 in Samarkand, Uzbekistan) . Qadi Zada was brought up and completed his standard education in his home town of Bursa, then studied geometry and astronomy with the theologian-encyclopaedist al-Fanari (1350-1431 CE) . Following this, Qadi Zada studied mathematics and astronomy in Transoxiana; then a great cultural centre. By 1383 Qadi Zada had already gained a great reputation as a mathematician by completing a treatise on arithmetic: Risala fi'l Hisab, a work which covers arithmetic, algebra and mensuration . Qadi Zada wrote a number of commentaries on works on mathematics and astronomy during his first years in Samarkand . One commentary on the compendium of the astronomer al-Jaghmini was written by Qadi Zada in 1412-13 CE, while a second commentary was on a work by al-Samarkandi. Qadi Zada's most original work Risalat al jayb (Treatise on the Sine)  was a computation of sines with remarkable accuracy. He published his methods in his Treatise on the sine and, although al-Kashi also produced a method for solving this problem, the two methods are different and show that two remarkable scientists were both working on the same problems at Samarkand; Qadi Zada computed sin 1 [degrees] to an accuracy of 10-12 (if expressed in decimals), as did al-Kashi . "The famous Gerbert, whose genius had unsuccessfully attempted the enlightenment of Europe nearly two hundred years before. The attainments of that accomplished scholar, respectable in any age, were so superior to those of his contemporaries that, as has been previously stated, they procured for him the unenviable and dangerous title of magician ." A.I. Sabra: Sciences; in Dictionary of Middle Ages; J.R. Strayer Editor in Chief; Charles Scribner's Sons; New York; p. 86. A.I. Sabra: Sciences; p. 86. G. Sarton: Introduction; vol. 1; p. 648. S.P. Scott: History of the Moorish Empire in Europe; J. b. Lippincott Company; Philadelphia; vol. 3; p. 476. Scott vol 3; p. 477. C. Ronan: Arabian; op cit. ; p. 224. -Ibn al-Banna', Ahmad b. Muhammad: Talkhis a`mal al-hisab. Edited by M. Souissi. Tunis: Université de Tunis, 1969. -J.L.Berggren: History of Mathematics in the Islamic World: The Present State of the Art. Middle East Studies Association Bulletin 19(1985), pp. 9-33. -J.L. Berggren: Mathematics and Her Sisters in Medieval Islam: A Selective Review of Work Done from 1985 to 1995. Historia Mathematica 24 (1997), pp. 407-40. -J.L. Berggren: Episodes in the mathematics of Medieval Islam; Springer, 1986. -M. Cantor: Vorlesungen uber Geschichte der Mathematik;4 vols. (on the history of mathematics: vols. I and II; Leipzig, 1900-08. -J. Hogendijk: The Geometrical Parts of the Istikmal of Yusuf al-Mu'taman ibn Hud: An Analytical Table of Contents. Archives Internationales d'Histoire des Sciences 41 (1991), pp. 207-81. -R. Lorch: Arabic Mathematical science: Variorum, Aldershot, 1995. -B. Rosenfeld and G.P.Matvievskaya: Matematiki i astronomi musulmanskogo srednevekovya i ikh trudi (VII-XVII vv), 3 vols. Moscow: Nauk, 1983. -J. Sesiano: Arabische Mathematik im 8.-10. Jahrhundert. In Butzer, P.L, Lohrmann, D., eds: Science in Western and Eastern Civilization in Carolingian Times. Basel: Birkhäuser, 1993, pp. 399-442. -H. Suter: Das Buch der Seltenheiten der Rechenkunst von Abu Kamil al-Misri. Bibliotheca Mathematica, dritte Folge 11 (1910-11), pp. 100-20. -H. Suter: Abhandlung über die Ausmessung der Parabel von Ibrahim b. Sinan b. Thabit. Aus dem Arabischen übersetzt und kommentiert. Vierteljahresschrift der naturforschenden Gesellschaft; Zürich 63 (1918), pp. 214-28. A. Von Braunmuhl: Vorlesungen Uber Geschichte der trigonometrie, 2 vols, Leipzig, Teubner; 1900-3. -F.Woep Arabic Sciences and Philosophy 3 (1993), pp. 7-53. R. Rashed: Les mathématiques infinitésimales du IXe au XIe siècles. 2 vols; Al-Furqan; London; 1993-96. A. Djebbar: L'analyse combinatoire dans l'enseignement d'Ibn Mun`im (XIIe-XIIIe siècles). Université de Paris-Sud; 1982. A Djebbar: Mathematics in medieval Maghreb; AMUCHMA-NEWSLETTER-15; Universidade Pedagógica (UP), Maputo (Mozambique), 15.9.1995. A.Al Daffa: The Muslim Contribution to mathematics, Croom Helm, London; 1977. K. Jaouiche: La théorie des parallèles en pays d'Islam. Paris;Vrin, 1986. D. Lamrabet: Introduction à l'histoire des mathématiques maghrébines. Rabat, 1994. F. Sezgin: Geschichte des arabischen Schrifttums. Leiden: E.J. Brill, 1967. C. Ronan: Arabian Science; op cit. ; pp. 224-5. A.I. Sabra: The Scientific; op cit. ; P. 185. A. Al-Dafaa: The Muslim contribution to mathematics; Croom Helm, London; 1977; p. 70. C. Ronan: The Arabian; op cit. ; pp. 224-5. G. Sarton: Introduction; vol. 1; op cit. ; p. 545. D.M. Dunlop: Arab civilization; op cit. ; pp. 228. See J. Jolivet; R. Rashed: Al-Kindi; Dictionary of Scientific Biography; op cit. ; pp. 261-6. E. A. Myers: Arabic Thought and the Western world. Frederick Ungar Publishing, New York, 1964: p. 11. Eugene. A. Myers: Arabic Thought; p. 11. D.M. Dunlop: Arab civilization; op cit. ; pp. 233. G. Anawati: Science, in The Cambridge History of Islam, vol. 2, edt. P.M. Holt, A.K.S. Lambton, and B. Lewis, Cambridge University Press, 1970, pp. 741-779. pp. 754-5. G. Anawati: Science; pp. 754-5. G Sarton: Introduction; p. 508. G. Sarton: Introduction; pp. 508 and 621. Al-Balagh and Djebbar, 1995b, in A Djebbar: Mathematics in medieval Maghreb; AMUCHMA-NEWSLETTER-15; Universidade Pedagógica (UP), Maputo (Mozambique), 15.9.1995. Al-Ballagh; Djebbar, 1995, b, in A Djebbar: Mathematics. G. Sarton: Introduction; op cit. ; pp. 998-9. J. J. O'Connor and E F Robertson: Arabic mathematics; op cit. M. A. Kettani: Science, op cit., p. 72. A.P. Youschkevitch; B.A. Rosenfeld: Al-Kashi; Dictionary of Scientific Biography; op cit; and J. J O'Connor and E. F Robertson: Arabic Mathematics, op cit. J. J O'Connor and E. F Robertson: Arabic Mathematics. A.P. Youschkevitch; B.A. Rosenfeld: Al-Kashi; at p. 256. A.P. Youschkevitch; B.A. Rosenfeld: Al-Kashi; pp. 256-7. Kary Niyazov: Astronomischeskaya shkola Ulugbeka; 2nd edition; Tashkent; 1967; pp. 141-2. A.P. Youschkevitch; B.A. Rosenfeld: Al-Kashi; op cit. ; at p. 256. H. Dilgan: Qadi Zada al-Rumi; Dictionary of Scientific Biography; op cit. ; vol. 11; pp. 227-9; at p. 227. H. Dilgan: Qadi Zada al-Rumi; op cit. ; pp. 227-9; at p. 227. H. Dilgan: Qadi Zada al-Rumi; p. 227. J. J O'Connor and E.F Robertson: Arabic Mathematics, a forgotten brilliance; op cit. H. Dilgan: Qadi Zada al-Rumi; op cit. ; at p. 227. S.P. Scott: History; op cit. ; vol. 3; p. 482.